Welcome to the Year of the Pig! 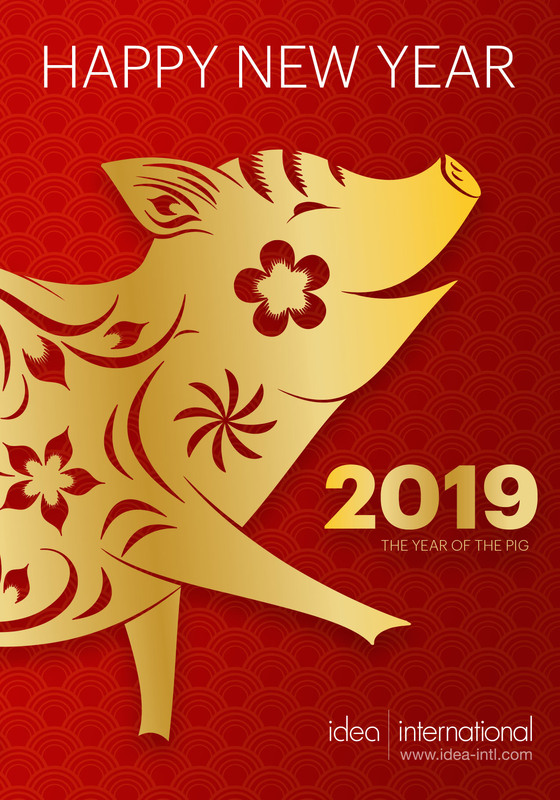 - Idea International, Inc.
Home » Newsletters » Welcome to the Year of the Pig! As the twelfth sign of the lunar year, Pigs are signs of good fortune and bravery. They are motivated to work hard, energetically and enthusiastically, on the most routine and challenging jobs. They are optimistic, gentle, and very focused; when they pursue a goal, they won’t stop until they achieve it. Pigs love to learn, but they pursue knowledge quietly, allowing others to do all the talking while they formulate a plan. They tend to compromise and stay on track. Their overarching purpose in life is for everyone to live in harmony. They tend to be tolerant of others, and because of the Pig’s bravery, Japanese often give their children names containing the word “Pig.” Both European and Japanese cultures measure a person’s bravery by the Pig’s—and their fiercer cousins, the wild boar’s—hunting skills and ferocity when it comes to pursuing a goal. Taking our cue from the Pig, at idea International we work with enthusiasm, energy, and a client-centered approach to everything we do. We pursue our work with a commitment to achieving success for everyone involved: our team, our workers, and especially you, our clients and partners. We are relentless in pursuing the resources that ensure your experience in the APAC region exceeds your expectations. We encourage you to leave your program in our hands while you explore our fantastic cities and cultures—or as we say, “peace of mind, half a world away.” Because of this outlook, we have built, and continue to build, a loyal following among exhibit and event marketers who know we will stop at nothing to ensure their success and who trust our knowledge, expertise, and fearlessness.